How Does Your Organization Stack Up with 2019 Education Services Trends? To stay competitive, it’s important to benchmark yourself and keep up with trends and best practices. Ideally, you’re working to stay ahead of the curve and blazing the trail for next practices. 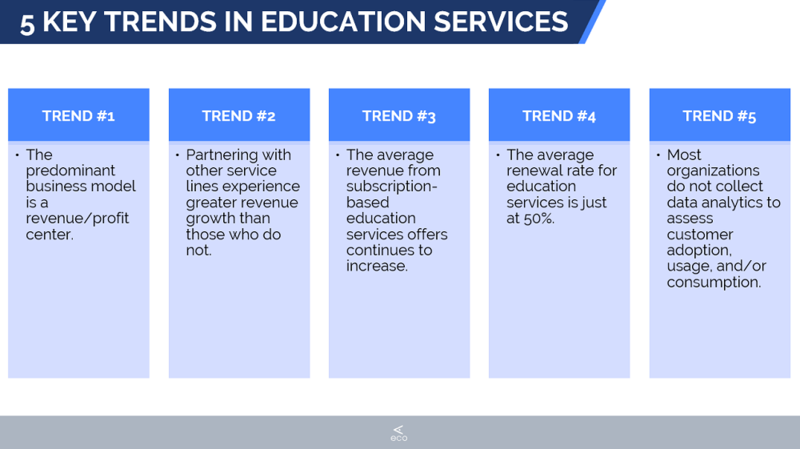 Here are some key trends around revenue and content today in education services, according to TSIA’s latest research, to keep in mind as you continue to develop and improve your customer training resources. 1. The predominant business model for education services is a revenue/profit center. This is where customer training produces more revenue than expenses to generate a profit. With 64% operating under a profit center, more organizations are moving towards monetizing their educational training rather than giving it away for free to customers. On the other hand, 14% of Education Services operate as a breakeven center where training generates an equal amount of revenue and expenses. In addition, 16% operate as a cost center with organizations giving away education training to customers for free; this is a shift from 21% operating as a cost center in the previous year. Although monetizing your online training has become popular, it is important to focus on your content consumption strategy. Whether or not your training content is free or fee-based, it does not guarantee that customers are actually learning and adopting your solution. 2. Partnering with other service lines experience greater revenue growth than those who do not. Benchmark data shows that those who partner with other service lines within your organization, experience greater revenue growth than those who do not. When you collaborate with other teams in your organization, you reach a larger audience for education. TSIA’s study showed that those education service departments that developed internal partnerships experienced over a 7% growth rate compared to those who worked in a silo that experienced just over a 1% growth rate. The takeaway here is to not work in a silo; collaboration is the key to increased revenue growth. 3. The average revenue from subscription-based education services offers continues to increase. Offering a subscription model to Education Services almost doubled revenue growth from last year with 21% of education service revenue coming from subscription offers at the end of 2018 compared to 12% at the end of 2017. Organizations are moving away from the traditional, transactional approach to customer training offers. The most common subscription offers included these three components: 1) E-Learning; 2) Hands-on lab environment; 3) Live virtual instructor-led training. 4. The average renewal rate for education services subscriptions is just at 50%. Clearly, subscription renewals is a major challenge many education services organizations face. Combat this obstacle by starting off with documenting a formalized subscription renewal strategy. According to neuropsychologists, you are more likely to accomplish your goals if you have them written out. 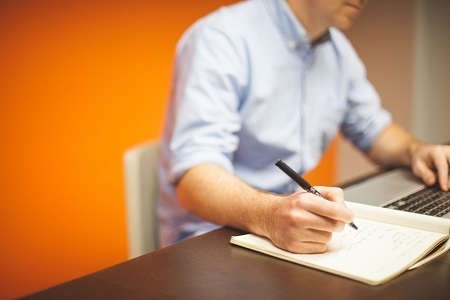 An important aspect of renewals to think about is content. People will not renew their online training subscription if there is no new content. As far as types of content, video is rapidly becoming the most preferred content type. 5. Most organizations do not collect data analytics to assess customer adoption, usage, and/or consumption of education offerings. 60% of organizations do not collect data analytics to assess customer adoption, usage, and/or consumption of education offerings. Without this critical data, it’s difficult to know how to drive consumption to enable your customers. Also, most organizations (55%) do not follow-up with customers regarding their usage of education services offers/subscriptions. These two weak links are ways you can improve your education service offerings to drive higher consumption and renewal rates. With the knowledge of these five trends on the current state of education services, how does your organization compare?